Celebrating Sankranti with the Pushpanjali Cooperative! The artisans of Pushpanjali celebrated Sankranti together. 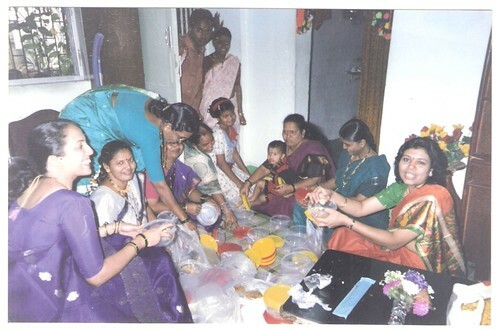 The Pushpanjali cooperative has been one of the biggest forces behind MarketPlace’s domestic violence program. In their own eyes, while their work as artisans is important, it is their social activism which is their greatest achievement. The activism has resulted not only in the group bonding, but also in the individual women artisans developing confidence in themselves and their leadership skills. The joy and unity of the Pushpanjali artisans was abundant on Sankranti! They spent a day sharing food, fun, and, of course, many til-gul and sweet words! Support the work of the artisans! Visit our website, www.marketplaceindia.com, any time to purchase the clothing and home decor items featuring the exceptional hand-dyed fabrics you love. Previous Post: The Team That Works Together, Plays Together!